This weekend, millions of people will be tuning into the big game to cheer on their favorite team and of course, catch those highly anticipated Super Bowl commercials. But this Sunday is not just a big day for the teams on the field and their fans, but also for restaurants and bars across the country. With that being said, if you’re a pub, grill, sports bar, pizza shop, or another type of food service venue, you should be prepared for an influx of customers and orders on February 3. So how can you best prepare for a profitable (but hectic) Super Bowl Sunday at your business? Check out a few fun tips below! Diners are always looking for good food deals, especially when it comes to special occasions, holidays, or sporting events. It is important to differentiate yourself from the local competition by offering Super Bowl Specials on highly sought after game-day treats like wings, pizza, or BEER. With a group of friends deciding the best place to watch the game, offering a two-for-one discount on appetizers or drinks is sure to attract them your way. Customers want good food and good beer at a fair price. As mentioned above, 50 million cases of beer are consumed during game time, so why wouldn’t your business offer beer specials for patrons? Especially for the big groups. A sure way to attract and retain Super Bowl viewers throughout the night! A number of people also prefer to watch the game from their very own couch at home. Many even host parties and invite family and friends over to enjoy the Super Bowl. When thats the case they’re looking for affordable food and drink options to feed their large crowds. This is where popular apps such as wings and pizzas, when paired with liter sodas, can be a big score for the Super Bowl festivity. Even offering special platters or one-day-only specials for takeout or delivery orders can allow your business to profit on game day. When it comes to the sticky wing sauce on people’s faces or the spilled drinks over bad calls during the game, your business needs affordable, yet effective ways to clean up these messes. That is where Morcon Tissue can be your teammate. From our extensive towel lines to our high-quality tissue options and of course, game-changing napkins in both white and kraft, we have everything you need to make it through Super Bowl Sunday and beyond! Want to learn more about our great mix of products? Calls us at 518-677-8511 or fill out this form to get the conversation started. We would be happy to provide a free paper consultation! With 30 years of industry experience, we love to educate, recommend and guide you through your paper buying decisions. 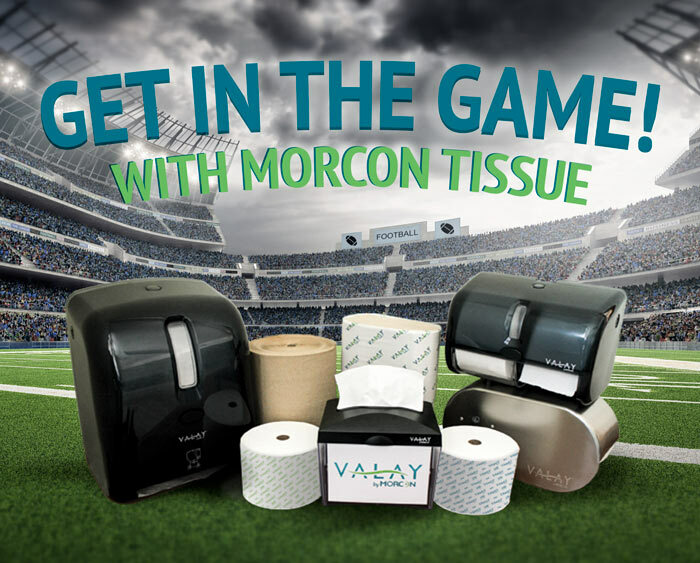 Partner with Morcon Tissue and you’ll walk away a champion. Speaking of champions, who do you think will win this year’s big game? Rams or Patriots?